Other Products by Quest Nutrition. Search other Protein Cookies products. Quest Protein Cookie gives you what sometimes you just can't do without—a cookie! Cravings can certainly be a struggle, which is why Quest Protein Cookies are baked just right, so they are still deliciously tender, and an awesome treat that you can enjoy whenever the mood strikes. 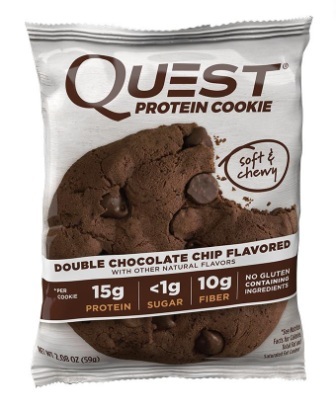 So, perhaps if nothing short of a cookie will sort you out, go for a Quest Protein Cookie. Each QUest Protein Cookie is jam packed with 15 grams of quality protein, 10 grams of fibre and not even a mere 1 gram of sugar. So if the little person on your shoulder is telling you to eat a cookie, then perhaps it's time to do just that. After all, these cookies are designed to maximise taste, and not break the caloric-budget. INGREDIENTS: Protein Blend (Milk Protein Isolate, Whey Protein Isolate), Butter (Cream), Soluble Corn Fiber, Erythritol, Palm Oil, Cocoa (Processed with Alkali), Unsweetened Chocolate, Calcium Caseinate, Natural Flavors, Water, Cocoa Butter. Contains less than 2% of the following: Sunflower Lecithin, Sea Salt, Baking Soda, Sodium Caseinate, Xanthan Gum, Yeast Extract, Steviol Glycosides (Stevia), Peanuts. Allergen Statement: Contains Milk, Peanuts. INGREDIENTS: Protein Blend (Milk Protein Isolate, Whey Protein Isolate), Soluble Corn Fiber, Butter (Cream), Palm Oil, Raisins, Erythritol, Oats, Natural Flavors, Calcium Caseinate, Water. Contains less than 2% of the following: Cinnamon, Sunflower Lecithin, Sea Salt, Baking Soda, Xanthan Gum, Steviol Glycosides (Stevia), Peanuts.